Most looking forward to in 2018 – finding my racing legs again! Favourite piece of kit – zip off warm up tights. Perfect for any occasion. Bikes – A Canyon Ultimate WMN CF SLX 8.0 Di2. Favourite piece of kit – A tough one between Rapha’s insulated Gilet, my much-saved-for Gore One X rain jacket (it is incredible) and my shiny new Les Filles QOM kit! Favourite food – dark chocolate, marzipan ritter sport, mince pies, Lincolnshire sausage. Spirit animal – I did a ‘what is your daemon’ Buzzfeed quiz once and got ‘Osprey’, which is exactly the kind of complimentary answer you want from ad revenue driving relatable content. Hardest day on a bike – Tour of Sussex Beachy Head stage. I was so happy it was over I cried. Favourite place to ride a bike – I love getting to know a route and then watching it change through the seasons; autumn-strewn Kent is pretty nice right now, but there’s not much that beats the big billowing skies of my home county. Most looking forward to in 2018 – racing with a proper team for the first time is going to be really great. I’m looking forward to playing a role in many Les Filles triumphs! But personally this year I want to finish Lincoln GP in the bunch, on my home territory. Hometown – Cambridge don’t you know! 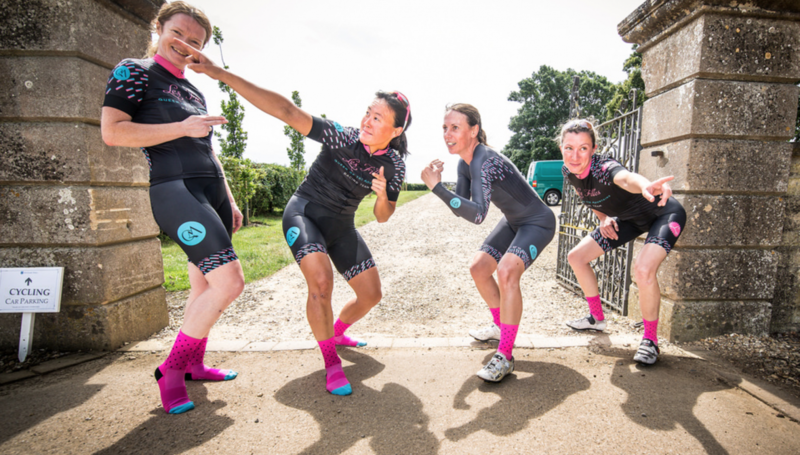 Favourite piece of kit – all Les Filles QOM kit. Canyon Sram Rapha kit that they’ve given me [for being shortlisted for the Zwift Academy] is beautiful too! Favourite food – cake. It’s how I keep my Danny Devito figure. Hardest day on a bike – 2013 EnergieWacht Tour in Netherlands. Got on a Cipollini wheel & ended up in 2nd group on road. Whoop! Then spent 100k going backwards, dying 100x! Baptism of fire. Nikki Juniper coaxed me over the line (she’s a ledge). Most looking forward to in 2018 – more of the same! It’s always fun with Les Filles. Favourite piece of kit – I don’t really have one! Love my Gabba but not appropriate in the summer! Favourite food – most things unhealthy! Hardest day on a bike – Probably a MTB Marathon I did in 2016; Alpen Tour Trophy Stage 3; 6hrs Of MTB with over 3,000m climbing! I’d also gone too hard the day before and was toast from the gun! I’ve had some training rides which have been some of the hardest rides I’ve done. Favourite place to ride a bike – Spain, Denia! Twitter – @karlaboddy but insta better (same handle)…..twitter I just moan to Chiltern Rail about the trains being late! Hardest day on a bike – have a few, main races that properly broke me are Mountain Mayhem a couple years back and Set2Rise. Favourite food – Haagen Daas Pralines & Cream with that liquid chocolate sauce that solidifies on contact with the ice cream. Yum. Hardest day on a bike – November 2015. Commuting to work from Putney to Brick Lane. Rain, 5 punctures and bloody late. Favourite piece of kit – X-bionic leg warmers. Favourite place to ride a bike – I quite like to discover new places. Most looking forward to in 2018 – CX National champs, All city centre crits & any racing that involves a weekend away!